I received the mentioned products from Scently Box in exchange for an honest review. The opinions contained within this review are mine and may vary from the opinions of others. Our subscription ships in your choice of three sizes monthly or every three months. The Mini Scently contains 3-4 products, Mod Scently contains 4-5 products and Ultra Scently contains 5-7 regular size products. Regardless of the size box you choose you will receive carefully curated, quality handcrafted products you’ll love. These boxes arrived and I was immediately both amazed and surprised. 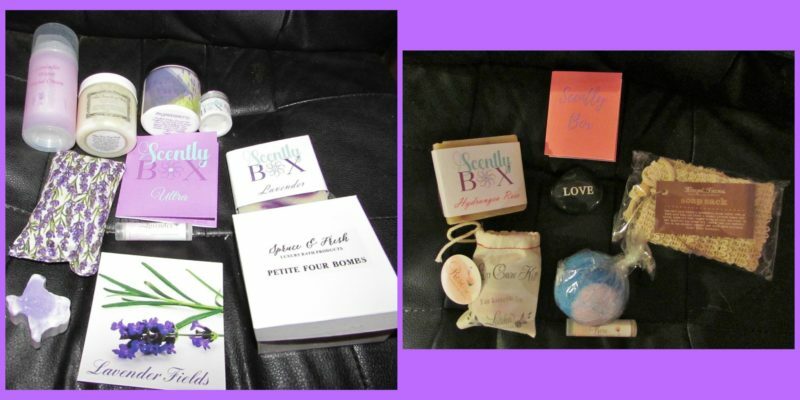 I received the 2 boxed pictured above- the lavender one as well as the rose. I am addicted to bath products, but honestly I am tired of the stuff that comes from the big box stores. I am really finding that I am more drawn to things that people put their love and hearts into. These boxes, especially the Ultra are packed with products that pleased my senses. Typically lavender is not my go-to scent but lately with having issues sleeping I have found that it is heavenly. Some favorites in that box include the Texas shaped soap, sachet and bath bombs. These products really smell like the real deal, because they are made with ingredients that we know and can pronounce unlike other companies. I love that when I put the bath bomb into my warm bath there was real lavender in the water! That was a surprise touch and honestly much appreciated. The Ultra Scently Box is definitely on my radar in the coming months. Now let us not ignore the rose box. My highlights of this box is the lip balm and the lip scrub. I also really enjoyed the “soap sack” because I often feel that I am wasting my hand crafted soaps because of lack of a way to store them, but this is absolutely one of the best things and one of those “I wish I had thought of that” items. I got an added little decorative rock that says LOVE and was able to add it to my collection of other decorative rocks that I have collected over the years. It was the perfect touch to this already awesome box. If you are looking for a great subscription to surprise a loved one with this holiday season, check out Scently Box. This would also make a great treat for yourself. I am so happy to be able to include this great box in our 2016 Holiday Gift Guide. « Splurge or Save: What Furniture Is It Really Worth Investing In?